Until the later Middle Ages, Birmingham was a small market town of relative insignificance. But during the 16th century the population began to grow as it became a centre for the metal working industry. The Civil War (1642-1651) amplified the demand for metal products as both Royalists and Roundheads required arms. The people of Birmingham sided with Oliver Cromwell and they supplied guns and swords to the Roundheads. By the end of the 17th century the town had a reputation for producing quality armaments and 15,000 people lived there. The Industrial Revolution caused the population of Birmingham to rocket and it developed into one of the world’s first major manufacturing towns. In 1800 there were 74,000 people living in Birmingham but by 1900 there were over 600,000 and it had become the second largest city in England. Today the figure stands at more than a million. Birmingham and the Midlands may not trip off the tongue as you list Britain’s great golfing regions, but the area offers superb variety and some very recognisable courses. No venue has hosted more Ryder Cups than The Belfry. The Brabazon Course was the site of four clashes between 1985 and 2002. The layout is synonymous with the development of the European team and the players’ emergence as contenders in the biennial tournament during the ’80s, ’90s and ’00s. Some of Europe’s greatest memories are rooted at The Belfry: O’Connor’s 2-iron, Torrance with his arms aloft, McGinley’s leap – all took place on the Brabazon. As you make your way round the course you can relive all those moments – every hole seems familiar. After a major facelift and reconfiguration the 6th is set to join its more famous cousins, the 10th and 18th, as a true standout hole. It now incorporates an intimidating lake-side green, a plethora of trees and some treacherous bunkering. It’s a second shot that will undoubtedly go down in golfing folklore. Playing the Brabazon, you have two tactical options. 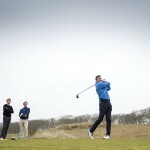 One: you can play sensibly and with good course management. Go for position from the tee and lay up where appropriate. Two: you can try to play it like the pros. Smash it at the 10th green in the style of Seve at the 1978 Hennessy Cup, then attempt to blast it over the water at the treacherous 18th. If you opt for the latter style you’re probably the sort of person who’ll stick around following the game to enjoy a night out in The Belfry’s famous Bel Air nightclub. No doubt the tales of the day’s golfing heroism will be even more impressive at 2am after a couple of bottles of champagne. Little Aston Golf Club, just outside Sutton Coldfield to the north of Birmingham, has a very different feel from The Belfry. A traditional members’ club, play is over a mature, parkland course lined by beautiful trees and flowering shrubs. The original design was by Harry Vardon in 1908 but as his layout featured a number of tough carries (deemed too hard for the members) Harry Colt was later employed to make the course a little more friendly. This must be one of the best parkland courses in the country. Superb springy turf, large and immaculately-kept greens and typical Vardon cross-bunkers are the outstanding features. What is perhaps most surprising is the peace and quiet. You’re just eight miles from the centre of Birmingham in an urbanised area, but you’ll hear barely a sound save for birdsong and the rustling breeze. Set in 300 acres of parkland, Kings Norton Golf Club is just north of Junction 3 on the M42. Founded in 1892, play was originally over nine holes laid out near Kings Norton station by David Brown (the then professional at The Worcestershire). The club moved from that site in 1970 to a new location at Weatheroak in North Worcestershire. In the early ’70s the club played host to three European Tour events: Tony Jacklin, Tom Weiskopf, Seve Ballesteros and Brian Barnes all competed around the course. Kings Norton has three excellent loops of nine holes giving three 18-hole options – Weatheroak, Brockhill and Wythall. Weatheroak delivers the sternest test. Made up of the “blue” and “red” loops it stretches to 7,021 yards from the back tees. This is a course where you must drive the ball well and the ability to hit it long gives a distinct advantage. The standard scratches of 74, 73 and 73 for the three layouts respectively compared with pars of 72 give an indication of the difficulty. Birmingham and its surrounds offer a feast of golf, from modern resorts to traditional clubs. Some of the country’s finest parkland courses can be found in the area and they should be explored. Four-star retreat owned by the Quinn Hotels group. Golf is on the doorstep and there’s an excellent leisure club and spa. Dining options range from the opulent French restaurant to the lively Sam’s Bar and Grill. Fifteen acres containing plants from tropical, sub-tropical, Mediterranean and arid climates. Has the world’s largest collection of Pre-Raphaelite paintings and drawings among its half a million objects.